Posted on March 22, 2019 at 3:24 pm. Over the past several decades, as the number of Spanish-speakers in the United States has risen sharply, the language itself has come to change and evolve. While it may not come as a surprise to most people, driving through places like Miami, Southern California, and many parts of New York City, Texas, Arizona, and New Mexico, you might feel as if you’ve found yourself smack dab in the middle of Central or South America. However, what many people may not realize is that the rapidly shifting demographics that have seen the population of Latinos/Hispanics grow from 9.6 million in 1970 to nearly 58 million by 2016 has also seen exponential growth in rural America. In places like Wilder, Idaho, in the heart of rural America, the Latino population has grown such that it has reached a majority of nearly 76% of the population. With these changes in demographics, the growth of the Spanish language has closely followed. There are now more than 50 million speakers of Spanish in the United States, including native speakers, heritage speakers, and second language speakers. This has made the United States the country with the second largest number of Spanish speakers in the world, next only to Mexico. Furthermore, with the wide geographic distribution of Spanish speakers in the United States, as well as the diverse origins of those speakers, the variety of Spanish spoken in the United States has been evolving as well. Of course, this should come as no surprise, as languages constantly evolve, and the dialects and regional varieties of Spanish are no exception. While some may assume that the two major varieties of Spanish are “Castilian” from Spain and “Latin American” Spanish, this would be a somewhat simplistic understanding. While it is true that there are some key similarities in the Spanish spoken in Latin America versus Spain (such as the use of the 3rd person plural pronoun ustedes in Latin American versus vosotros in Spain), it is certainly not homogenous. There are also significant differences among the varieties of Spanish spoken in Latin America that have developed over time as a result of contact environments, migration (both internal and external), and rural-urban linguistic polarization. For example, the use of the 2nd person singular pronouns tú, usted, and vos differ greatly throughout Latin America. Many Spanish speakers in Latin America have also adopted vocabulary from the indigenous populations in their respective regions, such as aguacate, jitomate, nixtamal, and tlacuache in Mexican Spanish, or guata (stomach) in Chilean Spanish. In Colombian Spanish, a tinto is a coffee, whereas it refers to a type of red wine in other Spanish speaking countries. And, finally, the use of the voseo in Chilean Spanish (and conjugation of the tú form of verbs) differs greatly from other Spanish dialects in South America. The above examples represent just a tiny sampling of the linguistic differences found in the varieties of Spanish spoken throughout Latin America. Invariably, these many dialects found their way to the way to the United States over many years, and as Spanish-speaking communities have become less isolated over time and mixed with other Spanish speakers of different origins, these dialects have come to influence each other. Of course, the greatest influence on the Spanish in the United States has been the English language. 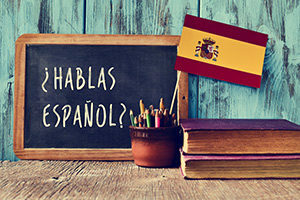 Not only has Spanish spoken in the United States taken on many English loanwords, but has developed its own sociolect, known as “Spanglish.” Spanish, however, is far from a standardized dialect given that it varies greatly from region to region and even community to community. For example, some versions of “Spanglish” are more Spanish-predominant, while others are more English-predominant. Spanish language media in the United States has also played a significant role in the evolution of the language. The proliferation of Spanish-language radio grew significantly beginning in the 1920s and has evolved into hundreds of Internet media outlets targeted at Spanish speakers in the United States and major television broadcast networks such as Univisión and Telemundo. While mass media has significantly contributed to this new “dialect,” however, Spanish in the United States is still far from homogenous. In the coming years, as the Latino/Hispanic population continues to grow, along with an increase in heritage and second language speakers of Spanish, the language will continue to evolve and change and grow even more distinct from its linguistic siblings in Spain and Latin America. Furthermore, to continue to serve the needs of the many Limited English Proficient (LEP) and non-English speaking immigrants from Spanish-speaking countries, businesses and governments will also continue to need the services of qualified Spanish translators and interpreters. There will also be an even greater role for Spanish translation and interpretation providers that are not only adept in the form of Spanish spoken in their native countries, but also in the unique variety of Spanish now spoken in the United States, and where the U.S. is the native country for so many now.